Kicking off Driver Appreciation Week, Pilot Flying J today announced the winners of its fifth annual Road Warrior contest, recognizing professional drivers for their hard work, perseverance and passion for driving with cash prizes. Victoria Andrade of Harlingen, Texas, Bob Loyd of Ottawa Lake, Michigan, and James Monclair of Marrero, Louisiana, have been named the grand, second and third place Road Warrior winners respectively. To honor Andrade as the grand prize winner, Pilot Flying J today surprised her with a celebration at the Pilot Travel Center near her hometown and presented Andrade with a $10,000 prize check. Loyd will receive $5,000, Monclair will receive $2,500 and the remaining nine finalists will each receive $1,000. Additionally, nominators of the grand, second and third place winners will also receive a $500 prize. The contest and surprise reveal of the grand prize winner is just one way the company is showing appreciation for professional drivers and raising awareness about the trucking industry during National Driver Appreciation Week. America’s 3.5 million professional drivers are an integral piece of the country’s infrastructure and this year’s Road Warriors are each making strong contributions to the economy, the trucking industry and their communities. The driver shortage is estimated to reach 174,000 by 2026, according to the American Trucking Association, which impacts everything from stocked retail shelves, fuel at the pump and expedited delivery of goods to consumers across the country. 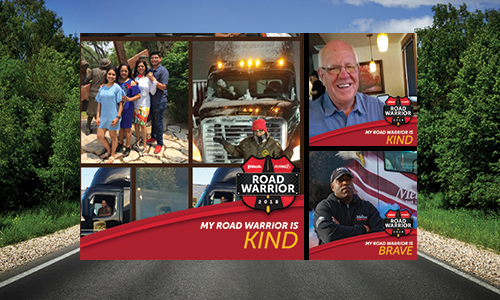 In addition to the Road Warrior Contest, Pilot Flying J has partnered with the American Trucking Association this month on an educational outreach program designed to raise greater awareness of the trucking profession and professional drivers’ tremendous contributions to our nation’s economy. Pilot Flying J is also driving awareness and appreciation of professional drivers by thanking them in-store throughout the month of September with money-saving offers and giveaways. Bob Loyd, second place winner: Bob has been a professional driver for more than 47 years. He is involved in numerous trucking charities and helped found Truckers United for Charities. He also volunteers his time serving on mission trips. James Monclair, third place winner: After achieving over 1 million miles with Melton Truck Lines, James became an Ambassador of the Road for Melton and serves as a mentor to other drivers. James is a veteran and volunteers to drive his wrapped veteran truck in the Tulsa Veterans Day Parade each year. He also makes an annual trip to St. Jude Children’s Hospital to volunteer and spend Survivors Day with his daughter. To learn more about the Road Warrior program, view exclusive content and read about the winners, visit RoadWarrior.PilotFlyingJ.com. To join the Road Warrior conversation, follow #RoadWarrior.